Carbone Lorraine (CL) is a clear World Leader in Braking Technology. One set of rear brake pads. 2014 TO 2018. A SET OF GOLD SINTERED. DISC BRAKE PADS. The heavier you are onbrakes, the more heat is generated.Sintered brake pads will not fade as much as organicbrake pads on those long steep descents. TO FIT YAMAHA YBR125 2007 ONWARD. SINTERED GOLD. A SET OF FRONT BRAKE DISC PADS. The heavier you are onbrakes, the more heat is generated.Sintered brake pads will not fade as much as organicbrake pads on those long steep descents. Semi Sintered Pads -. combines the highest qualities of an organic brake pad with the endurance of a sintered equivalent brake pad. Rear Disc and pads: 173664808056. For Yamaha YZF-R125. Front Disc and Pads to Suit: 173664811359. Unleash the full potential of your motorcycle !!! Suzuki GSXR1000 Front Brake Pads SBS RACE SINTER 806RS K4 K5 K6 K7 K8 K9 L0 L1 2004 - 2011 These top quality SBS front race brake pads are designed to give optimum on track performance for your motorcycle and are sold as a complete front set - 2 packs to change both calipers. Scandinavian Brake Systems A/S is the world's leading manufacturer of motorcycle brake pads for street, off road and racing. Since 2001 the RS compound has been used to win many world championship titles and national championships. Through continuous development based on results and feed back from the World Superbike Championship and the new Moto2 GP class, the RS compound is now introduced in an upgraded version pronounced RS- 10. Improved features like initial. THIS IS FOR ONE FULL SET OF FRONT BRAKE PADS (ENOUGH BRAKE PADS TO FIT BOTH FRONT BRAKE CALIPERS). A SET OF GOLD SINTERED. DISC BRAKE PADS. The heavier you are onbrakes, the more heat is generated.Sintered brake pads will not fade as much as organicbrake pads on those long steep descents. YAMAHA YZF-R125. 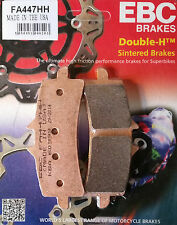 EBC double-H Sintered Brake Pads for Twin Pot Front Brakes. The Ultimate high performance braking and durability. 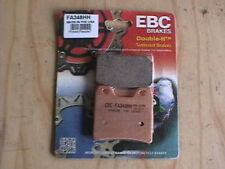 Pit bike EBC Double H Front Brake Pads. Fits pit bike twin pot front brakes. Our bikes and parts are tested by professionals! EBC/FA417/4HH Sintered Brake Pads (Front - Caliper set 4 pces) - Kawasaki Z750R (ZR750NBF-NCF/PBF-PCF/NBFA) 11-12 (x2 Req'd). EBC/FA417/4HH Sintered Brake Pads (Front - Caliper set 4 pces) - Kawasaki GTR1400 (ZG1400A8F-A9F/CAF-CEF/EEF-EGF) ABS 08-16 (x2 Req'd). SBS Race Sintered Pads. The perfect combination of fade-free brake performance, brake feel and thermal stability. Unleash the full potential of your motorcycle !!! Honda CBR 1000 RR 2004 TO 2015 Front Brake Pads SBS RACE SINTER 809RS These top quality SBS front race brake pads are designed to give optimum on track performance for your motorcycle and are sold as a complete front set - 2 packs to change both calipers. Scandinavian Brake Systems A/S is the world's leading manufacturer of motorcycle brake pads for street, off road and racing. Since 2001 the RS compound has been used to win many world championship titles and national championships. Through continuous development based on results and feed back from the World Superbike Championship and the new Moto2 GP class, the RS compound is now introduced in an upgraded version pronounced RS- 10. Improved features like initial bite, overall . A SET OF SINTERED GOLD. REAR DISC BRAKE PADS. The heavier you are onbrakes, the more heat is generated.Sintered brake pads will not fade as much as organicbrake pads on those long steep descents. TO FIT YAMAHA YZFR125 2008 TO 2018. Unleash the full potential of your motorcycle !!! Full Set of Front Brake Pads SBS RACE SINTER 2 x 841RS SBS Race Sintered Front Brake Pads 841RS For Brembo M4 Calipers These top quality SBS front race brake pads are designed to give optimum on track performance for your motorcycle and are sold as a complete Front set - 2 packs to change calipers. Scandinavian Brake Systems A/S is the world's leading manufacturer of motorcycle brake pads for street, off road and racing. Since 2001 the RS compound has been used to win many world championship titles and national championships. Through continuous development based on results and feed back from the World Superbike Championship and the new Moto2 GP class, the RS compound is now introduced in an upgraded version pronounced . 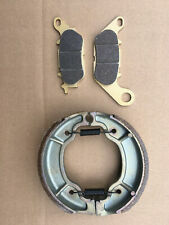 LEXMOTO VALENCIA 125 ZN125T-K. A PAIR OF FRONT BRAKE DISC PADS. Whoop racing high resistance sintered brake pads (twin pot front). W Racing High Resistance Sintered Front Brake Pads. -Whoop sintered pad range for racing pit bikes. -Fits pit bike twin pot front brakes. Genuine Suzuki GW250 Inazuma Centre Stand (2012-2016 models). Part No 42100-48820-000. YAMAHA MT125. A FULL SET OF GOLD SINTERED. DISC BRAKE PADS. The heavier you are onbrakes, the more heat is generated.Sintered brake pads will not fade as much as organicbrake pads on those long steep descents. IS TO BE APPLIED LIBERALLY OVER THE PISTON BEFORE IT IS SLIPPED INSIDE THE CALLIPER. BINDING IS CAUSED BY SEALS BEING CONSTRICTED AROUND A PISTON WHEN WATER HAS GOT IN AND CORROSSION HAS BUILT UP BEHIND. Unleash the full potential of your motorcycle !!! Suzuki GSXR1000 Front Brake Pads SBS FAST ROAD SINTER 806HS K4 K5 K6 K7 K8 K9 L0 L1 2004 - 2011 These top quality SBS front race brake pads are designed to give optimum on track performance for your motorcycle and are sold as a complete front set - 2 packs to change both calipers. Scandinavian Brake Systems A/S is the world's leading manufacturer of motorcycle brake pads for street, off road and racing. Since 2001 the HS compound has been used to win many world championship titles and national championships. Through continuous development based on results and feed back from the World Superbike Championship and the new Moto2 GP class, the HS compound is now introduced in an upgraded version pronounced HS- 10. Improved features . FZS600 FAZER 1998 TO 2003. THESE PADS ARE EU CERTIFIED. BRAKE PADS. SUZUKI GSF 600 BANDIT FAIRED. SUZUKI GSF 600 UN-FAIRED (NAKED). FRONT LEFT FRONT RIGHT AND REAR (3 SETS). EBC Double-H Sintered Pads SFA54 Square. The Ultimate high performance braking and durability. 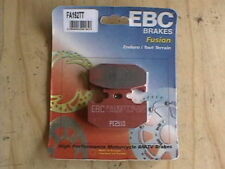 Pit bike EBC Rear Brake Pads. Fits pit bike single pot rear brakes - Square pad type. -Longest lasting pad of any material anywhere. 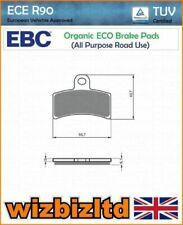 EBC FA447HH Complete Sintered Performance Motorcycle Brake Pads. Two sets of two FA447HH sintered brake pads. EBC produce the largest range of brake pads and brake discs in the world. EBC have always pursued the philosophy that brake pads and brake discs are safety products and are best hand crafted and made with care and maximum focus on high quality. FA199, AD099, VD260, FDB2003, SBS691. I bought these as sintered. FRONT BRAKE PADS. (to fit two calipers - complete front end). 2 sets fitted to the front. XVS1300A Midnight Star 2007-2013. XVS1300ACFD Midnight Star 2014-2016. They fit directly in to your original brake calipers. A&R Racing Services. 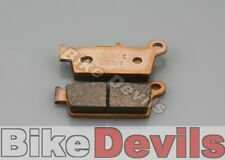 Kawasaki KMX 125 brake pads new unused. Sold my bike so have no use for them. 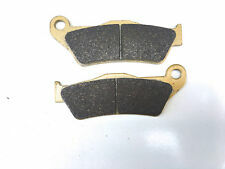 Here we have a pair of high performance carbon ceramic rear brake pads to fit various Suzuki bikes - GSF600, GSF1200, Bandit, GSX750, GSX1200, GSX1300, SV650, GSX-R1100, GSX-R750, TL1000 and also RG250 Gamma and RG500 (as front pads). TO FIT HONDA CBF125. 2009 TO 2015. FRONT BRAKE DISC PADS. As you can clearly see in the photos, there is the usual surface pitting, but this will clean up within a few miles of use. FA179, DP414, FDB781, SBS 663, VD255. XV535S Virago 1995-1997 (1 set fitted to the front). XV535 Virago 1995-2003 (1 set fitted to the front). FRONT BRAKE PADS. Price is for 2 PADS to fit one caliper. 841HS Unleash the full Stopping Power of your motorcycle !!! SBS Performance Fast Road Sinter Front Brake Pad set (1 packet 2 x pads for 1 calliper) for your Awesome Bike when stopping really matters. These top quality SBS Front brake pads are designed to give optimum on track performance for your motorcycle 1 pack to change caliper. Scandinavian Brake Systems (sbs) is the world's leading manufacturer of motorcycle brake pads for street, off road and racing. Since 2001 SBS Pads has been used to win many world championship titles and national championships. Through continuous development based on results and feed back from the World Superbike Championship and the new Moto2 Moto3 GP class,With this development the HS Street compound is now had a upgraded version which we are proud to. UN-LEASH YOU BIKES TRUE STOPPING POWER !!!! SBS Dual Carbon Front Brake Pads 841DC For Brembo M4 Calipers These Awesome race / fast road pads are the best performance carbon pads on the market, when it comes to out breaking your competition you can count on there dual carbon pads to do the job , Its a NO Brainier when it comes to performance as they have more titles and race wins than you can wave a stick at a lot of factory teams around the world run a brembo caliper and SBS pads and these guys would not put them in if they did not do the business with some of the fastest riders on the planet aboard. The SBS DC Dual Carbon road racing compound has since the introduction in 2001 proven to be the ”Choice of Champions”. World top racing teams have achieved a long row of race wins, lap. CBR 1000 (RR4/RR5) Fireblade 2004-2005. CBR 1000 (RR6/RR7) Fireblade 2006-2007. CBR 1000 (RR8/RR9) Fireblade 2008-2009. CBR 1000 (RRA/RRB) Fireblade 2010-2011. CBR 1000 (RRC) Fireblade 2012. CBR 1000 (RA9/RAA) Fireblade 2009-2010. R 1200 GS (All models) 2002 to 2013. R 1200 GS Rallye 2012 to 2013. R 1200 GS Adventure 2005 to 2013. R 1200 GS Triple Black 2010 to 2013. Sintered Rear Brake pads. THIS IS FOR ONE FULL SET OF FRONT BRAKE PADS (ENOUGH BRAKE PADS TO FIT BOTH FRONT BRAKE CALIPERS). Improved features like initial bite, overall performance and durability are highly praised by our top riders. FOR KAWASAKI KX80 KX85 KX100 1988 TO 2017. HIGH PERFORMANCE REAR DISC BRAKE PADS. QUALITY COMPETITION SPEC DISC PADS. Part Type : Brake Parts > Goldfren Disc Pads. FERODO BRAKE PADS FDB382 EBC FA92 HONDA CR125 MTX125 XL125 MTX200 XL600 XR250. Condition is New. Dispatched with Royal Mail 2nd Class. SBS Sintered Race Sintered Pads. THIS IS FOR ONE PAIR OF FRONT BRAKE PADS TO FIT ONE CALIPER. YFM 700 R RAPTOR. REAR BRAKE PADS. AB31 to AB38, AB40 to AB56. Scottish Highlands and Islands, Isle of Man, Isle of Wight, Isles of Scilly, Northern Ireland,Channel Islands. SBS Race Sintered Pads. The perfect combination of fade-free brake performance, brake feel and thermal stability. THIS IS FOR ONE FULL SET OF FRONT BRAKE PADS (ENOUGH BRAKE PADS TO FIT BOTH FRONT BRAKE CALIPERS). We will not pass on any of your personal details to third parties. We will always inform you about the status of your order as it changes. Front&Rear Brake Pads For Moto Guzzi Norge 1200 Sport 1200 Stelvio 1200 Rad.Cal.